Apple on Thursday activated single sign-on for tvOS 10.1 beta and iOS 10.2 beta, a hotly anticipated feature that allows fourth-generation Apple TV and iOS device owners to authenticate multiple streaming service apps with one set of credentials. Activated earlier tonight, the feature gives beta testers a more seamless content viewing experience by sharing login information with their pay TV service, Apple and third party apps. Acting as a universal login across a variety of apps, single sign-on enables a pay TV provider to automatically verify, and grant access to, streaming content that is part of a user's subscription. For example, customers who subscribe to HBO through their TV provider can use the forthcoming feature to automatically log in to the HBO Now tvOS app, as well as apps from basic cable channels. 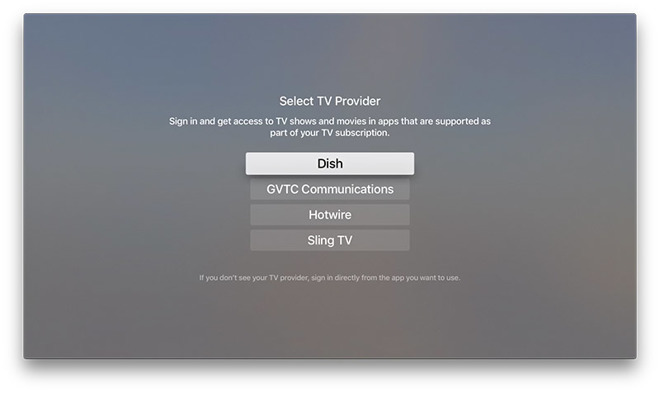 To initialize single sign-on, users must enter pay TV account credentials, specifically a username and password, into a new TV Provider menu option found in the Settings app on both tvOS and iOS (Settings > Accounts for tvOS). Apple's current beta versions are limited to Dish, GVTC, Hotwire Communications and Sling TV, though support for additional providers is expected before the feature sees release. Apple first announced single sign-on at the Worldwide Developers Conference in June, answering the call of customers who find it cumbersome to enter account details every time they download and install a new streaming app. Initially promised to launch with tvOS 10, the feature was not available in beta builds until today. It is unclear when Apple will make single sign-on available to the general public, but its activation today suggests a wide rollout is in the offing.